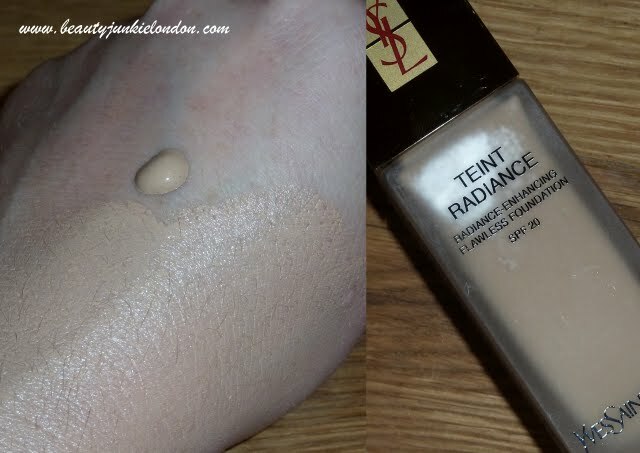 YSL is one of a few new foundations I have been testing out recently. This has been a bit of a shock to the system as I’ve been pretty dedicated to my Clinique Anti Blemish foundation that I tried and fell for a few months ago. I still love it and would say it’s about as close to holy grail as I’ve gotten so far during my make-up adventures… but that doesn’t mean it can’t be topped by something new. Back to the YSL. This is the new ‘radiance enhancing flawless foundation’ from YSL. In typical YSL fashion the bottle is pure luxe – with glass bottle and glossy gold lid. I can’t help but love some swanky packaging. It has a pump dispenser – another good thing – keeping the foundation bacteria free from contamination and grossness. Plus it’s easy to control the amount you dispense – I find one pump is fine for a day time face. Perhaps two for evening. Look closely at the bottle shot and you can see a bit of a lighter, silvery section. This is where there is a bit of build up of the iridescent particles that create the ‘radiance’. Basically there are really tiny reflective particles that bounce light back off the face, giving it the flawless effect. I like how this foundation smells – I know this might sound a bit off – but it smells really fresh and almost fruity. I’m always won over by a good smell – especially if it’s something on my face (that sounds really wrong) but you know what I mean… if it’s close to your nose then it needs to smell good! It’s smooth with good, medium coverage that can be built up easily. Easy to blend – although on the hand swatch I have left it heavy so you can see it. I love how glowy it is – it really does make me feel my skin looks radiant and funnily enough the radiance thing seems to help with the fine lines around my eyes too…score. Best thing about this foundation is that it looks great in photos – ideal for nights out. It does have SPF 20 in it, so great for daytime if you want a flawless finish day to night. I prefer this foundation for night/nights out use to daytime. Have you tried any YSL foundations? What do you think? my goodness, your skin looks air-brushed! i definitely need to check this one out. how long can you wear this foundation for? Looks gorgeous on, your skin looks amazing! Might have to give this a go. It makes your skin look luminous without looking liked you have used foundation. I have never tried a YSL foundation but I may have to take a look next time I’m at the counter. It lasts really well actually -the pic above is at the end of a work day. I did set with powder on the t zone in the morning and touched up around midday but it held up pretty well! It will tend to get a bit greasy around the tzone if you are prone to shine in that area. Your skin looks beautiful, whats your skin type? My skin type is combination – dry cheeks and around the eyes but oily t-zone. I have never tried YSL before. This really does make your skin look flawless! Duty free doesn’t count indeed. I’m tempted to try other YSL foundations to see if they smell as good! I threw away the box and now I can’t rem what colour I have – anyone able to tell me if there is any info on the bottle to let me know as I can’t see it!